Manchester United vs Liverpool. Some great memories come to mind when a United fan hears these words. Over the past years, this fixture had produced some scintillating results with some really iconic performances. But the latest instalment of this rivalry was a weird one. The biggest game of English football began in the strangest way possible with Liverpool given an indirect free kick from inside the box with just 40 seconds after kick off. The Scousers didn't make anything of it but that was just the beginning of a very anomalous afternoon. A foul from Jordan Henderson on Rashford after 8 minutes had the entire crowd unsettled as it seemed inevitable that United's No.10 was to be subbed off. But then out of nowhere, other United players started dropping to the floor. First, it was Ander Herrera who pulled his hamstring and on came Andreas Pereria at the 20th-minute mark. The mere idea of a midfield of Andreas Pereira and Scott Mctominay in Manchester United's biggest game of the season would have sent millions of United supporters across the globe into a depression but their nightmare was unfolding right in front of them. After Herrera, it was his countryman Juan Mata who also couldn't continue. Ole Gunnar Solksjaer was forced to make his second sub with just 25 minutes gone. Ole might have turned things around at Old Trafford with his positivity but this exact moment showed why Ole was still a novice in management. He had a fully fit Alexis Sanchez, raring to go but the Norwegian opted with a half-fit Jesse Lingard as Mata's replacement. The boy from Warrington gave his everything for the club and the manager but his body gave up with 5 minutes to go in the first half and Alexis was eventually sent on. In the middle of all this, Liverpool had an injury crisis of their own with Roberto Firmino injuring his ankle and being replaced by Daniel Sturridge. In between all these injuries, neither team dazzled the 70 odd thousand in the stadium. United had a few decent openings, the most notable being Romelu Lukaku's clever ball that cut through Liverpool defense and sent Lingard 1v1 with Allison, only for the latter to bravely smother and get the ball. Liverpool had more possession but it was mainly sterile. Their attempts to break down United's defense failed again and again as the likes of Lindelof and Shaw who stood their grounds. De Gea had to make just one routine save from a speculative shot from Sturridge at 40 yards. It was expected that Liverpool would come roaring out in the second half and attack a weakened United side but what happened was anything but that. Jurgen Klopp's men, like in most of the first half, laboured to create even a single opening for the next 45 minutes. They tried clever play around United's box to release Salah and Mane through but just like in the first half, they met an in-form United defense. The fact that Liverpool were chasing all 3 points in pursuit of their first ever Premier League title and Mohammad Salah was subbed off with 10 minutes to go speaks volumes. 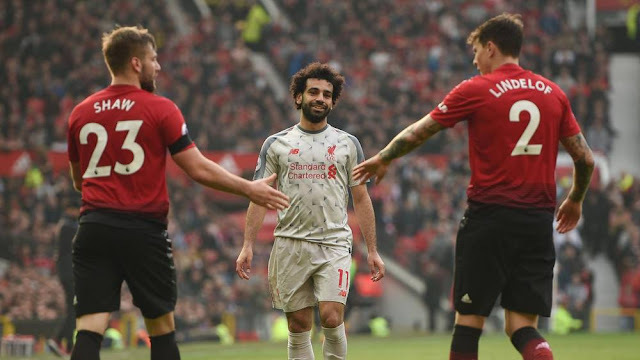 Luke Shaw and Victor Lindelof had fully nullified Salah and Chris Smalling dealt with the threat of Sturridge and Mane. The atmosphere inside Old Trafford was absolutely majestic as the fans knew that all the untimely injuries had their beloved team in trouble and they needed help. The Stretford End was probably at its loudest in a long long time and this certainly lifted the spirits of the 11 men giving their heart, soul, and sweat for the badge. United didn't have their best players on the pitch but they certainly had the better chances out of the two teams in the second half. Chris Smalling had forced Matip to turn the ball into his own net with a low cross but the former was judged to be marginally offside. Romelu Lukaku operated as a right winger in the second half and bullied Andrew Robertson into the ground. His pinpoint crossing had Van Dijk and Co. scramble for safety and right on the 90th-minute mark, Lukaku's bewitching cross almost reached Smalling at the far post. It ended 0-0 and it felt like a point gained for Solskjaer's men, considering they played an hour of football with 10 men and a hobbling Marcus Rashford. The next few days are going to be extremely tricky for Solskjaer as a beleaguered United team are to play four crucial matches in two weeks time. As far as Liverpool are concerned, they did get back to the top of the table with this one point but it has certainly not made their fans happy. They feel their team and the manager had an opportunity of a lifetime to claim victory and huge three points on enemy territory but they failed to do so. About a month ago, Liverpool had a chance to go 10 points clear of Manchester City but on Sunday, they huffed and puffed to be ahead by even 1 point.